In 2018 we saw the “Triple H Effect” in the land market, a horseshoe trend in the retail market, and “A Tale of Two Property Types” in the industrial market. 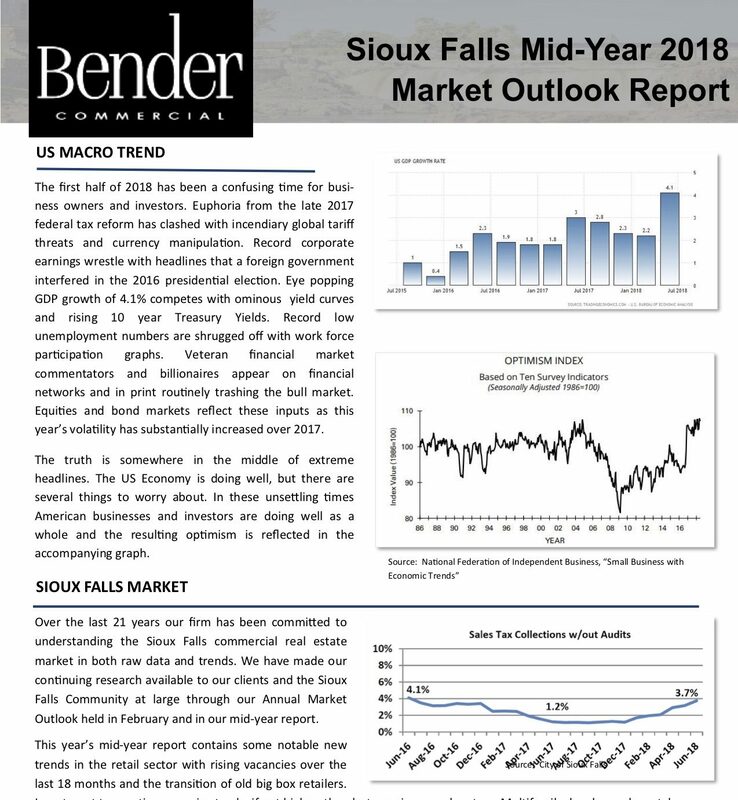 See what other trends the Bender Commercial team pulled from the data in the 22nd Annual Market Outlook to get a sense of what the Sioux Falls economy did in 2018 and what we predict it will do in 2019. From zombie retail to e-commerce, our brokers predicted plenty of changes in the Sioux Falls commercial real estate market at the 2018 Market Outlook. We’re excited to release our 2018 Mid-Year Market Report to see where we were right, where we were wrong, and where the Sioux Falls, South Dakota, and the Upper Midwest markets are heading. Download the report below. Bender Commercial returned to the Belbas Theater at the Washington Pavilion to present the trends we saw across the commercial real estate market in 2017. See what we’re predicting for the 2018 land, retail, office, industrial, and investment segments of the market. Download our slides to follow along with our presentation to make your own predictions. Join Michael Bender, Andi Anderson, Rob Fagnan, Reggie Kuipers, and Nick Gustafson as they present what the robust 2015 Sioux Falls economy did in this year’s Market Outlook. Can the land, retail, office, industrial, and investment market segments keep pace with the record year? Download the slides and listen to the presentation to see what we predict for 2016.
Review the data, listen to the predictions, and join the conversation surrounding the 2015 Market Outlook as we look at the previous year’s economy and see the indicators pointing to future growth in retail, office, industrial, investment, and land.